I like learning from our customers about the various ways they’re using our products, especially when it comes to Neutrix Cloud. 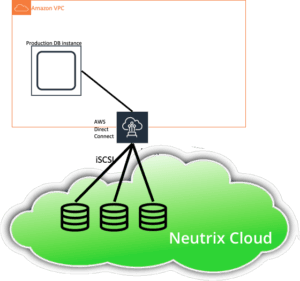 I’ve recently written about how Neutrix Cloud can be used for rendering a movie in a multilcloud environment, as well as how it can work with AWS Elastic Map Reduce. In this post, I’ll cover a dev&test scenario, in particular as it applies to a database environment. Let’s assume you are running a large scale database in a public cloud or in your datacenter, consuming terabytes of block storage. This could be Oracle, MS SQL, or mySQL. You want to spawn a copy or two of the production environment as a pre-production testing environment. How long would it take you to create several copies of this data using a native, public cloud storage solution? How much would it cost you? Now let’s assume a database is still running in a public cloud, but the data is stored on Neutrix iSCSI volumes. These snapshots are created instantly, have no performance impact on your production, but even more important – when initially created, and until you change any data, they’re totally free. They don’t cost you anything. These snapshots can now be accessed from a separate set of DB servers, offering instant, affordable provisioning of your dev&test environments. As soon as the environment is not needed anymore, it can be instantly removed. 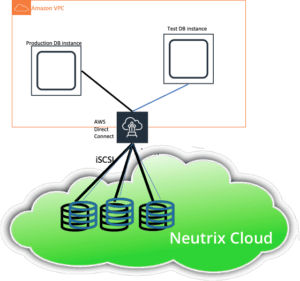 There many other use cases available with Neutrix Cloud storage as a key component. I’ll cover some more of them in future posts. Stay tuned, and explore Neutrix Cloud on your own. All you need to do is to contact your INFINDIAT account team.